Injuries bring pain and inconvenience. It takes weeks or months for a wound to heal completely. While the patient is under recovery, they may need longer hospital confinements and regular health appointments. Should wound care be this physically and financially stressful? Comfort and Care Health Services LLC says NO. Being a home health agency in Chillicothe Ohio, we offer practical and convenient solutions for patients to recover fast and easy in their most familiar territories. Through our wound care service, patients can now discharge from the hospital, save bucks from costly medical expenses, and get the treatment they need to heal and recover at home. Healing can be different for older adults. The natural aging process can result in a slower response rate to treatment and recuperation. Seniors can also be more susceptible to complications as compared to younger patients. Having a nurse at home brings many benefits, like speeding their recovery and preventing clinical barriers. Our nurse can help in wound management at home. A trained eye can easily detect all changes happening to a patient’s wound. They can help assess the healing process, coordinate with your primary physician, and create a treatment plan that’s best for you. We pay close attention to your overall well-being. The power of self-talk plays a great role in having a positive attitude on your recovery. It helps to achieve good and rapid clinical outcomes. Our licensed professionals extend their expertise by ensuring patients and families have an optimistic state of mind. Our home health care services are designed to promote your holistic healing right at home. 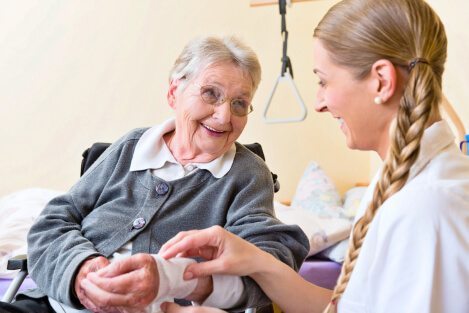 Our team is comprised of highly skilled nurses, therapists, and home health aides with experience and training in wound treatment and management. Through their expertise, patients with clinical needs can recover safely and comfortably at home. We will provide no-obligation home health needs assessments for clients at home. Send an online request here. If you wish to know more about wound care, please do not hesitate to contact us today. Comfort and Care Health Services LLC provides home health care services for families across Chillicothe, Ohio. This entry was posted in Wound Care and tagged Home Health, Recover at Home, Wound Management. Bookmark the permalink.